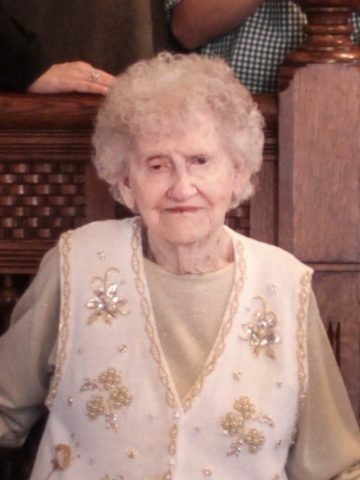 Miss Helen Marcel Watson age 91, of Hendersonville, TN, passed away on Sunday, May 27, 2018. Miss Watson was born in Temperance Hall, TN, on February 8, 1927, the daughter of the late Edgar Watson and Bobbie Watson. She was a member of Central Baptist Church. Miss Watson enjoyed babysitting all of her nieces and nephews. She will be remembered the most for her sweet, kind, caring, and humorous personality. In addition to her parents, Miss Watson was preceded in death by two nephews, Eddie Watson and Randy Watson and a great-niece, Heather Watson. Survivors include her two brothers, James (Katherine) Watson and Earl (Robbie) Watson; nieces, Rhonda Tidwell, Michelle (Chris) Warren, Kimberly (Darren) Reed, and Melinda (Robert) Webb; nephew, Ricky Watson; great-nieces, Tracie Watson, Ashley (Adam) Kerth, Brittany Caughran, Melanie (Jake) Curtis, Caitlyn Reed, and Kira (Spence) Richey; and great-nephews, Derek (Monica) Watson, Dustin Caughran, Nick Caughran, Brian (Amber) Watson, Jeremy (Elayne) Tidwell, Matthew Tidwell, Colin Warren, Grayson Warren, Devin Reed, Austin Reed, Braiden Reed, Chase Webb, and Dylan Webb. A Celebration of Life will be held Thursday, May 31, 2018, at 3:00 P.M., Hendersonville Funeral Home with Brother Mike Shelton officiating. Interment to follow at Hendersonville Memory Gardens. Gathering of Family & Friends will be held Thursday from noon until the funeral hour at Hendersonville Funeral Home. I was sorry to read about Helen’s passing. She was a great friend to my Mother and so was your family. I will always be grateful for you and Helen. I will keep you in our prayers.